Streamlined CAD makes design work easier than ever. Whether you’re bringing in a file from an outside CAD package or designing one yourself, Mastercam’s powerful CAD engine gives you control over the final details of even the most complex jobs. Quickly and easily separate solid assemblies. Work with your existing CAD files. Mastercam helps to preserve design intent with model-based definition (MBD) support and acceptance of varied file formats. These include IGES, Parasolid®, SAT (ACIS solids), AutoCAD® (DXF, DWG, and Inventor™ files), SolidWorks® (including history tree), Solid Edge®, SpaceClaim, STEP, STL, and more. 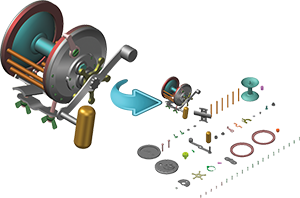 Add-On translators are available for Siemens NX, CATIATM, Pro/E (PTC Creo), and more. Getting a part file from an outside source can pose unique challenges. You might need to repair a surface, work with a mesh, cap or hide a feature, create an electrode, or just make sure your fixtures are represented on the part. 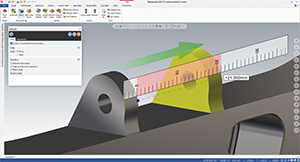 Mastercam includes a powerful set of model prep tools to make sure the process goes smoothly. From robust surface creation and editing to “push-pull” solid model editing, Mastercam gives you the tools to bring a part from the designer’s desk to your machining process, fast. …or designing your part from scratch. Having powerful CAD at your fingertips makes your CAM system that much more effective. Mastercam includes a robust set of modeling tools, from complete wireframe and surface modeling to solid modeling. A true hybrid modeling system, Mastercam lets you create, combine, and machine whichever CAD geometry suits your needs. Push, pull, remove, and directly edit features on new or imported solids, even if they have no history.